When sifting through the Census Bureau data on America’s Families and Living Arrangements I noted some interesting blips in the data. Since I’m fascinated with outliers I was drawn to one group in particular. The narrow definition of a stay-at-home dad affects the official number of stay-at-home dads in the U.S. The chart below visualizes the number of married couples with children under 15 living in the household where neither parent works. 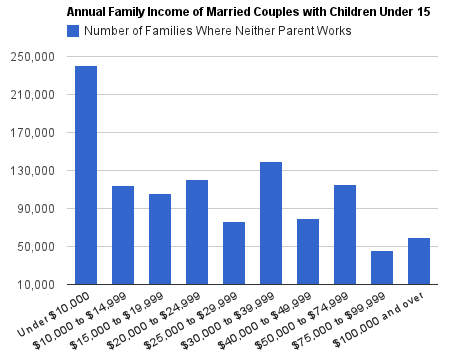 60,000 married couples with children under 18 had neither parent working, but a family income in excess of $100,000 per year. Based on the Census definitions, all income is included in the calculation of family income. Large categories of family income not earned from working are: interest, dividends, Social Security, pensions, public assistance, alimony, and child support. Thus early retirement is a likely explanatory factor as are investment wealth, income from trusts, and child support given to re-married custodial parents. A total of 221,000 couples earn at least $50,000 a year while neither of them works. These couples all have children under the age of 18 in the house with both parents not working. However, based on the formal definition of stay-at-home dads used by the Census Bureau, these fathers are not necessarily stay-at-home dads. Overall, 1,097,000 families with children under the age of 18 have both parents not working.